Couple observations: Some kind of pharmacy that's uppper level front and center right next to a Karmelkorn. As for the ice rink, try renting skates there today without being required to wear a helmet. IS THIS WHERE TONYA HARDING TRAINED? I just started following your site because I was hoping you'd post something about the Lloyd Center. 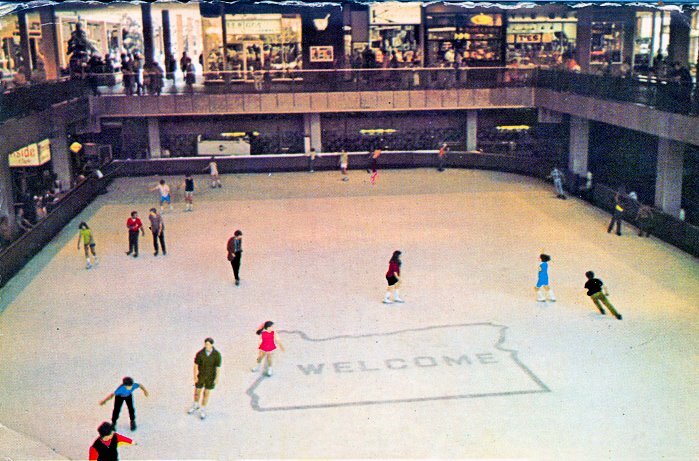 This was the pre-eminent mall when I was a child growing up in Oregon. My older sisters went with friends up to the skating rink there as early as 1960. For years this was the only public ice rink in the entire state. The Lloyd Center has been called the first indoor mall in America. Does anyone know if that's true? Tonya Harding trained at the Clackamas Town Center as far as I know, not the Lloyd Center. Hmm, some of the people on the ice rink looks like they were painted in. Very weird bright colors and hardly any shadows. Nice. I've always loved malls with ice skating rinks, though I suppose they're hard to sustain at today's energy prices. Just wanted to verify what the first poster said. That is in fact a Karmelkorn. The huge K on the white sign gave it away! They are still around by the way, but have scaled back their operation since the 70s. I like the outline of the state of Oregon set into the ice. Some of the skaters are glowing, aren't they? Maybe the photo was "colorized" by Ted Turner. Photo was taken in 1969. Film of that era was created to artificially over-emphasize reds as it was felt to create a "warmth" to flesh tones. By today's standards it's a bit garish. But quite an authentic photo, I'd say. Right you are, Anonymous, about the film and photographic practices of that era. That's what's going on with the colors here. You see it all the time in vintage photos. I've seen so many I don't even notice it anymore. I love this photo! I skate at this rink every Monday night -- they hold adult ice skating classes through a local community college -- as well as the normal classes for the kiddos. They're always packed. It's really fun! The rink gives a sense of vibrant energy to a place that can feel so stagnant (malls, bleh) -- there are comfy chairs and benches placed all around the perimeters for shoppers to sit and watch. More malls should do it. I worked at the ice rink from 1966 until 1970. Each part of the season there would be different paintings on the ice. The oregon sign would be summer. The people are real. You can see a person in red on the left talking to another person. His name is Tony. The Ice rink had patrol employees to assist skaters which Tony was one. During christmas time and lloyd centers birthday it would be so packed with skaters you could not fall on the ice without starting a chain reaction of kids falling. During Christmas time at the lloyd center there would be so many thousands of people you could not stand next to the railing to watch the skaters or find a place to part in the 88,000 parking stalls. It was a very fun place to work back then.